Star Union Dai-Ichi Life Insurance is a top insurance company that offers both individual as well as group plans. Under each main type of plans, there are several categories of plans designed for each specific purpose. Whether you are looking for a health plan or a child plan or a retirement plan or protection plan or a wealth plan, you can count on the company to provide you with superior-quality services. You can choose from the 3 term insurance or protection plans for extensive protection when unfortunate events occur. Each of these plans will help your family members when you are not around. They will not have to count on others for financial support. They can be financially independent and attain their various goals in life successfully. You and your family members can lead a financially safe life even if some uncertain and unfortunate event occurs. You can choose a base protection plan or a rider protection plan from the company. You will receive high sum assured amounts with these protection plans by paying affordable premiums. Among these plans, you get to choose exclusive protection for damage or loss caused by accidents. This plan offers great life coverage through which your family members will be provided with good financial protection after your death. It is an amazing term insurance plan that will give you a high sum assured. The premiums for this plan are economically priced. With this plan, your dependents can continue to live as usual even if you get injured or permanently disabled. The sum assured amount for this plan ranges from Rs.25 lakhs to Rs.100 crores! With this protection plan, you will receive tax benefits as per the Income Tax Act, 1960 according to the sections 80C and 10(10D). You will need to remember that these benefits can change according to the updates in tax laws which happen frequently. If you go for high sum assured, you can enjoy excellent rebates on your premiums. This plan offers excellent financial security to the family of the deceased policyholder. The dependents of the policyholder will not have to suffer from lack of funds when the life insured dies. With this traditional rider plan, they can lead a decent lifestyle without having to ask others for funds. This is a rider plan that offers great benefits to the policyholder as well as the nominee. With this rider, the nominee chosen by the policyholder will receive 10% of the rider sum assured on a yearly basis for a tenure of 10 years. This is provided when the policyholder dies. This rider benefit will be given apart from the benefit that is offered with the base plan. This rider can be taken at the time of the policy commencement or when any policy anniversary comes. You can select a regular payment option, a limited payment option or a single payment option. The maximum policy period for this rider plan is 30 years. You can be assured that you will receive a regular income for a long period of 10 years. This way, you will be financially stable even after the breadwinner of the house is not around. This add-on rider along with you basic insurance plan will be very advantageous to you and your near and dear ones as the rider offers a lot of benefits. You can make your premium payments for this rider on a monthly, quarterly, half-yearly, yearly basis or even through a single payment option. If you select the ECS or Standing Instruction payment mode, you can make only monthly payments for your premium. You will be given a grace period of 30 days even for this rider plan during which you can make your pending premium payments. If you choose the monthly premium mode option, you will get a grace period of 15 days. This rider offers useful benefits for any accident that is caused to a policyholder. With this plan, you can get extensive security when you suffer due to an accident. Whether the policyholder dies due to an accident or suffers from permanent disability due to an accident, he or she and the family members will get good financial support for meeting the costs required for treatment. This rider gives 100% of rider sum assured when the life insured dies due to an accident. Once this is provided, the policy contract will be terminated. When the policyholder suffers due to a total or permanent disability due to an accident, the policyholder will receive the rider sum assured in 10 half-yearly installments which will be equal. The installment amount will be the rider sum assured multiplied by 10%. You can go for single premium or regular premium or limited premium under this rider option. SUD Life Family Income Benefit Rider - Traditional Minimum: 18 years as on last birthday Maximum: 60 years as on last birthday 65 years as on last birthday or the maturity age of the actual insurance plan, whichever is lower. The minimum premium will depend on the sum assured that you have selected for your rider plan. SUD Life Accidental Death and Total and Permanent Disability Benefit Rider Minimum: 18 years as on last birthday Maximum: 65 years as on last birthday 71 years as on last birthday or the maturity age of the actual insurance plan, whichever is lower. Minimum: Rs.8 for a sum assured of Rs.10,000 for a normal life if the regular premium payment option is chosen. Maximum: Rs.73,000 for a sum assured of Rs.50,00,0000 for a normal life if the single premium payment option is chosen for a policy period of 47 years. 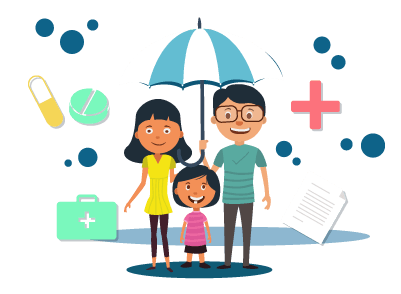 Why one needs SUD Life Insurance protection plans? Star Union Dai-Ichi Life Insurance is a prominent private life insurance company that is committed to delivering accurate and quick insurance solutions. You can rely on the organisation to provide you with customised support as per your individual preferences and conditions. With the protection plans from SUD Life Insurance, you will get comprehensive life cover. All your beloved dependents can remain financially safe even if something ill-fated happens to you. When you choose any of the protection rider plans, you will get additional security that will help you and your folks lead a risk-free lifestyle.